Clearly it is not Spring yet. The weather down south today was hinting that warmer weather is on its way, but we are most definitely not there quite yet. Because of this, rhubarb was impossible to find. I drove around to grocery stores in all parts of the county, but there was none to be found. I made an executive decision that strawberries would be equally, if not more, tasty than the rhubarb and subbed it in. Lent is killing me. I gave up sweets. What in the world was I thinking? I love to bake, and I love to eat baked goods even more. It didn't help that Valentine's Day was only a few days before Lent began because I have pounds of candy and cookies taunting me, simply waiting for me to break. However, I am proud to say that I have not even nibbled at a single dessert yet. Lucky for me Sundays are feast days. Before Lent started, I decided that I would not really use all of my freebies and gorge myself at the end of every week. Instead, I chose to indulge wisely and moderately. I had only one biscuit (technically not a sweet in my book) and the surrounding fruit. Hey, fruit's good for you, right? Anyway, I don't feel bad for two reasons: 1. I was pretty conservative with my cheating. 2. This was out of this world delicious. The fruit substitution only improved the flavor of this dessert. 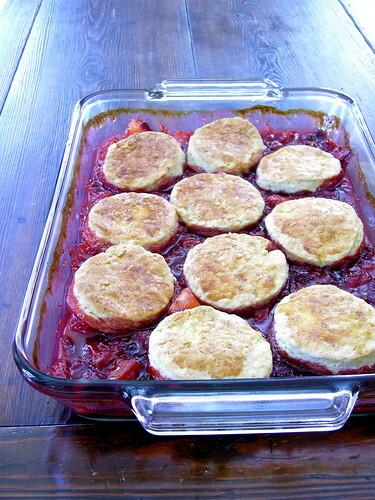 Of course, I don't know what it tastes like with the rhubarb, but I would imagine that that would be too many sour flavors competing with one another in one dish. The strawberries' floral sweetness was just the right partner for the tangy pineapple and the tart raspberries. Thank God for feast days. Preheat the oven to 400. Toss strawberries, pineapple, and raspberries with flour, sugar, vanilla, and kirsch in a 2-quart baking dish. Bake for 40 minutes, stirring several times during baking. Sift together the flour, salt, sugar, and baking powder. Incorporate the butter into the flour mixture using a snapping motion until the butter is in pea-sized lumps. Mix in the heavy cream and gather dough into a ball. Roll out on a lightly floured surface to 3/4-inch thick. With a biscuit cutter dipped in flour, cut out 8 biscuits. 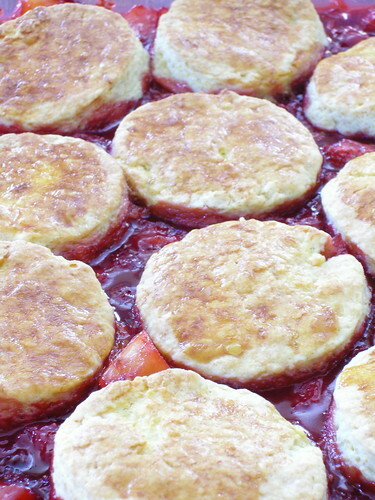 Remove fruit from the oven and place biscuits on top. Whisk the egg yolk and milk together, and brush biscuits with mixture. Bake for 15-20 minutes more, until the biscuits have browned. 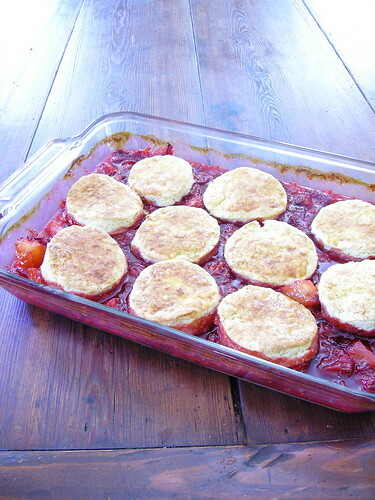 This cobbler looks absolutely delicious! I am not quite sure why I decided to give up sweets for Lent as well. Hayley!! this cobbler was absolutely amazing!!! i took almost all of HK's share in English class the other day! Feel free to make it again and give me some!!! CdebW and I devoured this in English! Yum, looks beautiful and very yummy! 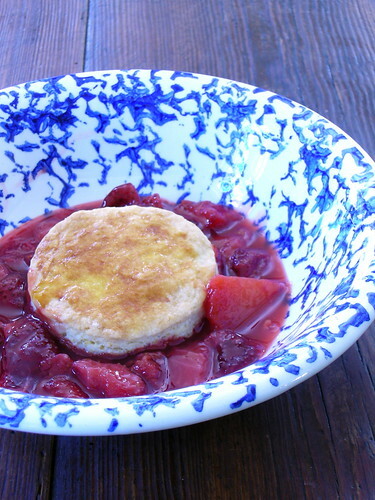 I just made rhubarb compote with a hint of cinnamon... Lovely!